The lobby at the entrance to the Senate is a multipurpose space for reception and access to areas designed for rooms on the ground and monumental marble staircase, at the center of architectural composition. Floor has a geometric design, containing a play performed by using colors, mainly white marble and red marble of Moneasa Ruschita. 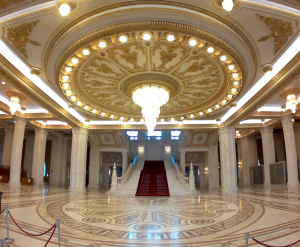 In the center of the hall is made of a mosaic of circular shape. Ruschita white marble, the columns are carved with floral motifs inspired by church architecture. Monumental staircase was intended to be an existing copy of the Winter Palace in St. Petersburg. The scale is 30 m high and 27 m wide, and stairs, and railings are constructed contratreptele marble. Above the stairway is a blue glass dome and chandelier. It may be noted that the reason that the ceiling is reflected in the decor floor mirror, which is represented by a mosaic inspired by the one discovered at Histria presence reminiscent of ancient Greek colonies in Romania.